Much like his Fluid Smartphone, Brazilian designer Dinard da Mata has developed another wearable gadget that becomes a fashion accessory to complement the style of next-gen users. 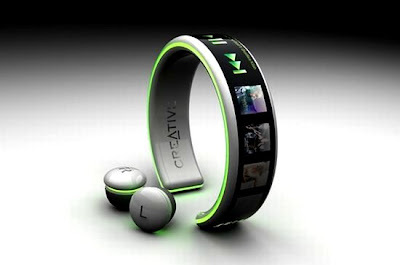 Hailed as “MP3 Player Creative,” the portable music player features a flexible OLED screen that other than displaying the playlist also lets the user select the song or control volume with just a touch of a finger. 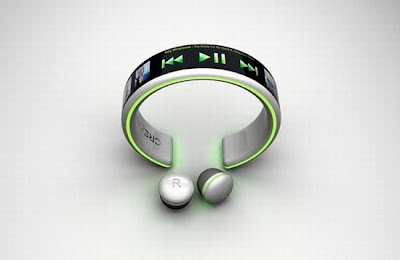 Worn around the wrist like a bracelet, the MP3 concept gives easy access of the functions to the user. In addition, the sleek music player includes wireless headphones to offer clutter-free music on the go. Where can I get ahold of some of the ear buds ?